While Poke’ and Ceviche may be the latest craze around town, we’ve been making our House-Made Poke’ and Ceviche for decades now. Our Poke’ recipes harken back to our old family friends, the Tamashiros, in Hawaii. 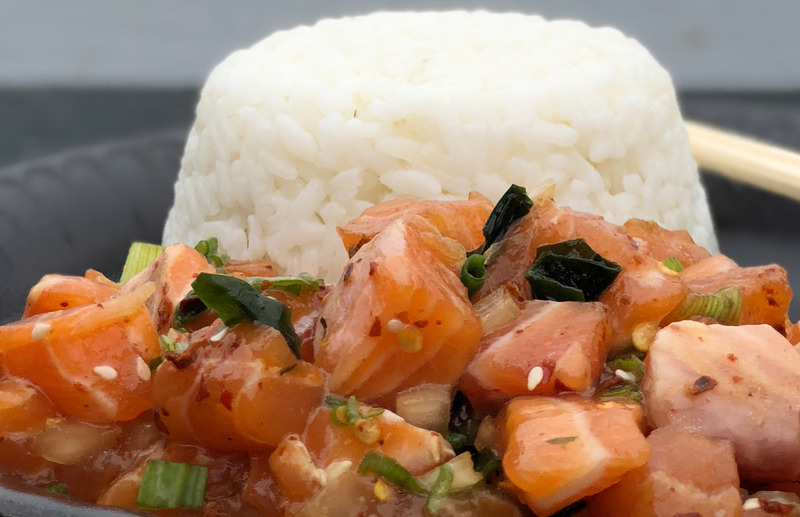 Pete Sr. became business partners and friends with the Tamashiro family back in the 1960’s, and during one of their visits to Quality Seafood they suggested we offer Poke’, as they did in their market back home. We started off with just two recipes back then, we now make 8-10 varieties of Poke’. Unlike the new trendy Poke’ shops that frequently use frozen Tuna, we make our Poke’ fresh, and only use the freshest fish. Our house-made Ceviches are made daily. They are full of fresh and vibrant flavors, they make a great option for those looking for something that is both tasty and light. Our Ceviche section offers Shrimp Ceviche, Fish Ceviche, Shrimp Aguas Chiles, and Mexican Shrimp Cocktail. All served with Tostadas and Tapatio. We also offer a house-made Marinated Anchovy. This classic, Italian style snack, has a delicate balance of garlic, oil, vinegar and subtle spices. Definitely a taste of the Old World. Planning a party or large gathering? We can make large batches of Poke’ or Ceviche fresh to order. Just give us a call.